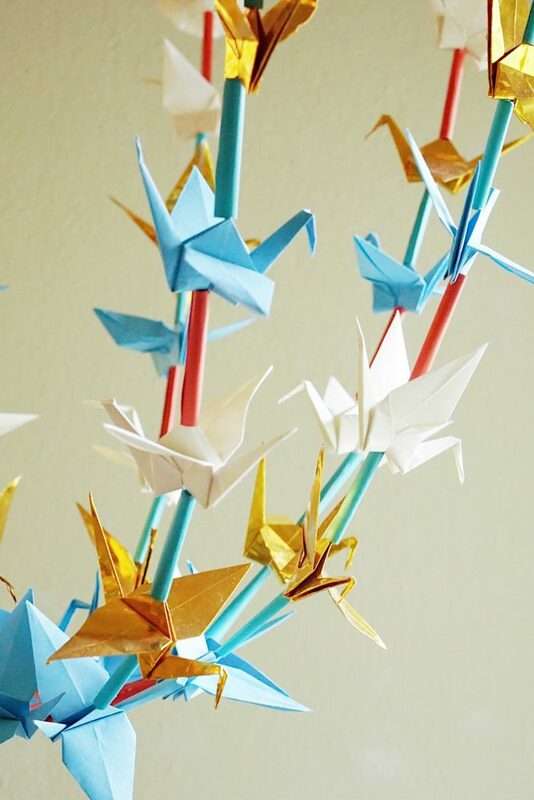 I began folding paper cranes last fall when my son was in the hospital (you can read more about that story here), and they will always hold significance for me. As our stash of paper cranes has mounted, I knew I wanted to make something with them. Eventually the idea of combining cranes with the traditional Polish pajakis came to mind. So I began working on my paper chandelier excitedly, albeit months ago. As a full-time freelance social media manager these days, most of my making is reserved to grocery lists, dinner, and the occasional yummy loaf of bread. But when I do get the urge to make something a little more crafty, something with a personal connection is more valuable to me than disposable cutesy crafts. This is my sacred corner in my house. It’s where I sit and stare wistfully out the window. It’s where I meditate and breathe and let go of the mountains of anxiety that pile up in my mind. It is the room of my own. 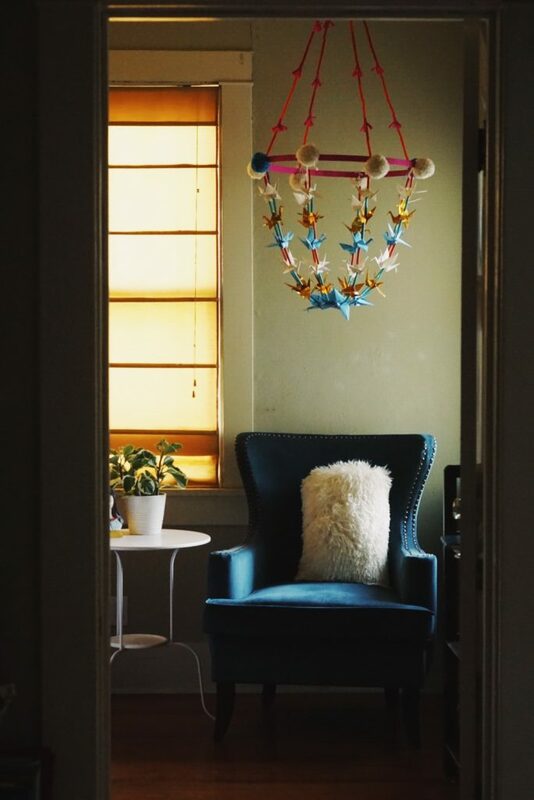 The peacock-blue chair is one of the first pieces of furniture I bought for myself when I began my journey through divorce. I fell in love with it at World Market and miraculously fit it into my old mini clown car like Mary Poppins majestically stashing all the things in her carpet bag. The side table is another piece I fell in love with at Ikea, and the plant is the lone piece of live greenery I currently have in my home. The fuzzy pillow was a gift from my mother to hold when a much needed hug isn’t within reach. 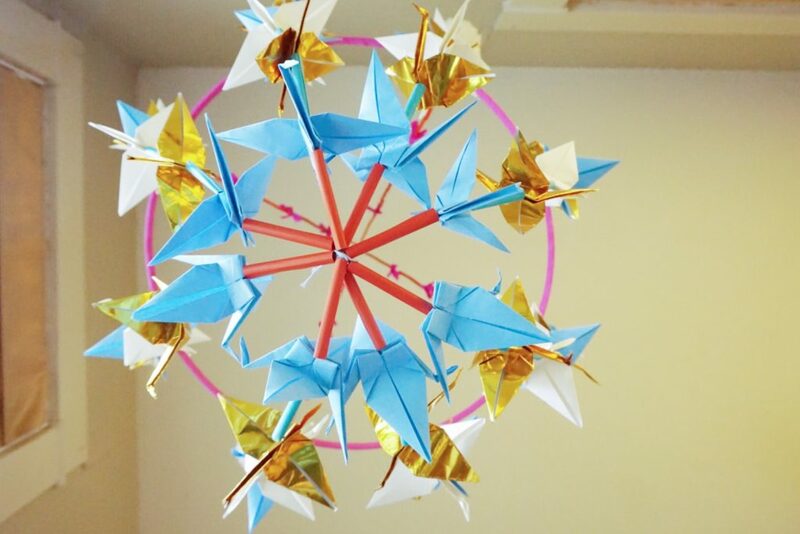 And the paper chandelier, my origami pajaki, is one of my rare and recent makings these days. Balancing mamahood, entrepreneurship, and all the spinning plates in between requires mindfulness. And folding paper cranes was one way I found the time to breathe and keep swimming during one of my most difficult experiences. The slow intentionality in folding each square piece of paper brings me into the moment and the physicality of being. It takes me away from ruminating on uncontrollable things. 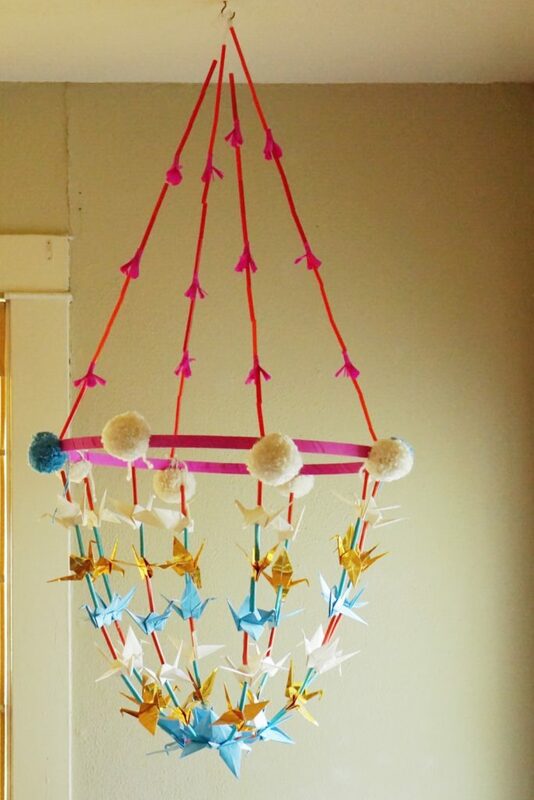 To make my paper chandelier, I loosely followed the instructions from this post by Oh Happy Day. Instead of creating my own wire hoop, though, I wrapped crepe paper around a large, unused embroidery hoop. I bought both the crepe paper and gold foil origami paper on Amazon, and loved using both. I also made paper straws from my stash of scrapbook paper. Some plastic straws were reused when I ran out of paper ones. And lastly, I used some stashed yarn to make pom poms. The entire process was very organic. I fiddled here and there with how I strung the cranes. And I still need to glue the pom poms in place so they look a little less wonky. Which I may or may not get to doing, and I’m okay with that. Because done is far better than perfect. I miss making regularly and have felt guilty at times for not making it more of a priority. But there are seasons to everything, yes? Somewhere, in a parallel universe, I am a magnificent maker of all the things that end up collecting dust in this one. And perhaps one day those universes will converge and the dust will be shaken off of undone things. Until then, I’ll keep my wabi sabi paper chandelier hanging over my head, reminding me of the moments that are worth stopping for.